The pay matrix is a really simple, predictable and easily understandable. While the interaction with the commission was going on, the stakeholders stated a lot of demands that started from common entry pay, existing pay structure rationalization, treatment of cadres, and also about the transparent pay structure. 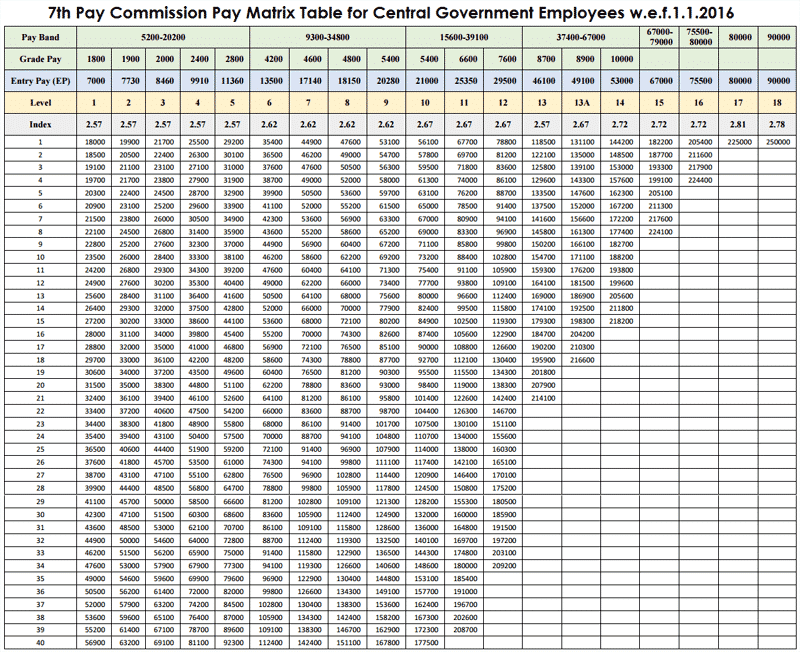 All the new features within pay matrix of 7TH CPC subsume the grade pays and this new rationalized matrix model offers a complete detail regarding the levels of pay in a simple chart. Now the employees are able to see the pay level, where their pay grade stands and how is their career going to progress. The commission also has set up simplified procedures for the calculation of pension. The system of grade pay has been dispensed and a new functional level has been proposed by merging the grade pay with the pay in the pay band. The pay structure that is in vogue, shall dictate the definite boundaries within which the pay of Individual lies. The pay matrix clears out all the doubts within the progression of salaries for instance it has become really easy for an employee to understand how much he/she has a promotional chance within a certain cadre and also which employees do not have a chance of promotion. This can be done just by weaving through the pay matrix and assuming the financial progression of MCAP. With the huge opportunities made available by the present government, the 7th CPC has created the new pay matrix and this has led to a lot of competition within he human resources The best available talents within the government are attracted wit clear salary structure. It was mentioned in the 6th CPC that the grade pay shall be equivalent to 40% of the maximum pre-revised scale, but thee grade pay shall constitute actual fitment, but that computation varied to a great extent. With the implementation of the recommendations from 7th pay commission, it was prominent that the difference in 4 pay bands was much more than the other three pay bands. 1. Improved than the 6th CPC Employees are able to see the pay levels and their progress in career paths through 30 years. The promotional aspects of employees shall also be cleared. 2. The rate of annual income is fixed at 5% Considering the present real estate trends, the rate of HRA has been allocated. 3. All the allowances shall be enhanced with 3.93 times This is necessary to cope with the inflation rate. A lot of pay allowances are actually taken away from employees in the name of income tax, service tax or sales tax. And also the allowances are paid in proportion to the prevailing price hike and this is why the allowances should be exempt from income tax calculation.